Manchester has many cotton connections - though most people are hardly aware of it nowadays. When the Cotton Statue, in St Ann's Square was unveiled, most people had no idea what it was. 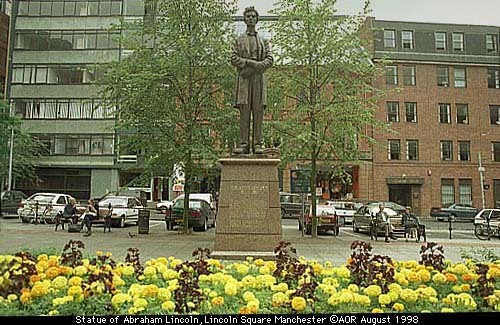 Cotton linked Manchester with the southern states of America in the 1860's, a fact remembered on the Abraham Lincoln statue, just south west of Albert Square. A reader message below asks for information about a cotton mill accident. See also the Abe Lincoln feature on the Manchester Online front page. EYEWITNESS IN BERLIN is finally ready, and so I'll take this opportunity to get up on my soap box and sound off about Manchester's image abroad, which I had a chance to think about as I drove across Europe. Much is said about "Manchester - A European City". Occasionally, plans to develop the Irwell embankments provoke headlines such as "Manchester - Venice of the North". Comparisons with Barcelona and Bilbao are also made, and I think there are some resemblances with Berlin. However plans to further "Europeanise" Manchester and play down its gritty, urban industrial heritage may in my opinion be counterproductive. No matter how much Manchester tries to be like Barcelona by having street cafes and arts festivals, Barcelona will always have more cafes and a better climate. And no matter how much work is done on beautifying the Manchester Ship Canal, the Grand Canal in Venice is always going to be more impressive. While I was in Berlin, I met freelance book publisher Ditta Ahmadi, who is interested in using some of my Manchester pictures (including the one of Quarry Bank Mill below) for a history book about the industrial revolution. Sitting in Berlin, Manchester seemed an awfully long way away, right out on the periphery in fact. "Previously," she told me, "there was a feeling that cities like Manchester were, somehow, behind the times. But now we're becoming aware that there's a resurgence going on there, and that things are improving." That's nice to hear, but what can we do to sing Manchester's praises, so that people all over the world can identify us? Trying to be the same as the rest of Europe is in my opinion going to make Manchester less identifiable and unique, not more. Some have suggested a new world class building should be built in Manchester - that's certainly a good idea. But I think that rather than trying constantly to move Manchester closer to Europe, we should be playing up Manchester's links with North America. The statue of Abraham Lincoln is a good example of the many links that exist between the US and here. In the former Docks, now Salford Quays, names like Huron Basin, and Ontario Basin remind us of Manchester' links, via the Ship Canal, with Canada. In Trafford Park, you'll find 1st, 2nd and 3rd Street. The warehouse buildings of Ancoats were used as models for buildings in industrial cities like Detroit and Pittsburgh. The fire escapes round Princess Street and other city centre streets always remind me of those in New York. Manchester's black community have made Black music a part of the city, such that three girls from Moss Side are topping the American charts. So perhaps Manchester could be promoted as a bridge between Europe and America, just as it was many years ago, when, like Liverpool, it was a staging post for European migrants, some of whom stayed. Any suggestions for a twinning with a major North American city? In the meantime, have a look at Eyewitness in Berlin. Eyewitness in Chicago is hopefully coming soon! 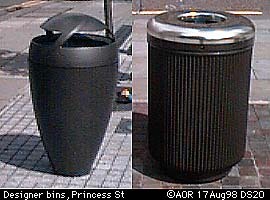 RUBBISH BINS CAN BE ART, as can be seen here behind Manchester's Town Hall, where two attractive designs have been put on show by the Council. The public are invited to give their opinion on them. So which one do you prefer, the curvaceous gunmetal grey one on the left, or the straight-sided, chrome and corrugated one on the right? The best designs will be used in Manchester's new city centre, which is currently taking shape. It's a pity they didn't decide to try out the metallic palm trees, proposed for the new square. Will they turn Manchester into the "Miami of the North"? I hope not. Would you have any information on an accident that may have happened in the 1930's that killed a couple of men and injured a few others. They were moving machines from a top floor, as they put the machine on a lift it fell "the full drop" with machine and five men. These were the words from a letter from my great uncle who has passed away since, and the information received was not complete or in many cases the thoughts of a seventy seven year old person. In an case, I have been seeking to verify this information with no luck. Maybe you could direct me!!!! Unfortunately, such accidents were fairly commonplace in the mills. In order to find a reference to it, you'd need to be more exact about your date and location. Does anyone out there have any ideas? 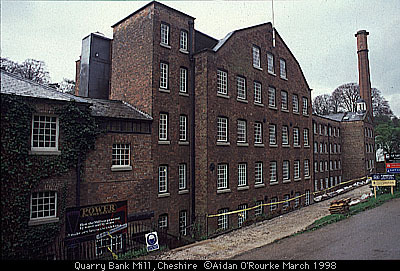 In the meantime, here's a famous cotton mill, now an award-winning museum, Quarry Bank, Styal, near Manchester Airport. I am trying to find relatives in Manchester. Have contacted archives and Manchester Evening News to no avail. Can you help or offer advice? Trying to find relatives of John Newman. Born Dublin Ireland. Son of William and Margaret nee Farrell, brother William deceased 4/6/1930, sister Jane or Jenny deceased around 1920. John married Mary had three children James, Kathleen and Alice. Last known address 36 Westinghouse Road Trafford Park. Grandchildren of William, his brother, doing family tree. Any suggestions were to search next would be a great help. Sorry you've had no luck so far. I'd advise try In Touch again, accessible from the Manchester Online front page. Otherwise, a professional family researcher may be able to help. Has anyone got any other ideas?